Details relating to the Belgian Commemorative of 2005. 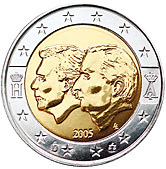 This coin celebrates coming into effect of a revised economic treaty between Belgium and Luxembourg. The original treaty came into force in 1921. The motif is simply the effigies of the two heads of state. On the left Grand Duke Henri of Luxembourg and on the right is King Albert II of Belgium. On the outer ring are the monograms of the respective heads of state. In the outer ring around seven o’clock is the mint mark and at around five o’clock is the mark of mint director. Within the inner circle at five o’clock are the initials of the designer LL. An interesting feature is that nowhere on the coin is there a country designation showing that the coin was issued by Belgium. Return from Belgian Commemorative 2005 to euro coin collector.